The Avidemux  video editor comes from a different era than today's dominant multitrack editing programs. The nonlinear approach is undoubtedly better for editing and creative effects. But, if you want to just cut the ends of videos, convert them to another format, or apply effects to the entire clip, multitrack editors are overkill. Simple tasks like that are easier to handle with the linear and single-track aspect of Avidemux (Figure 1). Figure 1: The cutting functions and number of effects in the linear Avidemux editor are meager compared with those of nonlinear multitrack editors; yet, the program can handle many file formats and codecs and converts easily and quickly. Avidemux also recognizes more video formats and codecs than most other specialized editors. If you're familiar with the old Windows program VirtualDub , you'll immediately feel at home with the Linux program that's been active since 2002 on SourceForge. Picking up Avidemux for the first time is easier than learning the much more complex applications with a nonlinear design. Navigating through a video is done via a simple slider in the lower third of the window instead of with a timeline with units. However, the program shows the current position with an additional time field in the format hours:minutes:seconds:hundredths of seconds . Manually entering a value in this field moves you to the appropriate spot. To the right of the slider, the program provides a jog wheel (Figure 1) – similar to the device on many professional editing tables and video recorders. With it, you can fast-forward or rewind at various speeds depending on how far you press the jog wheel by moving the mouse to the right or left. This tool helps you find scenes in longer videos. 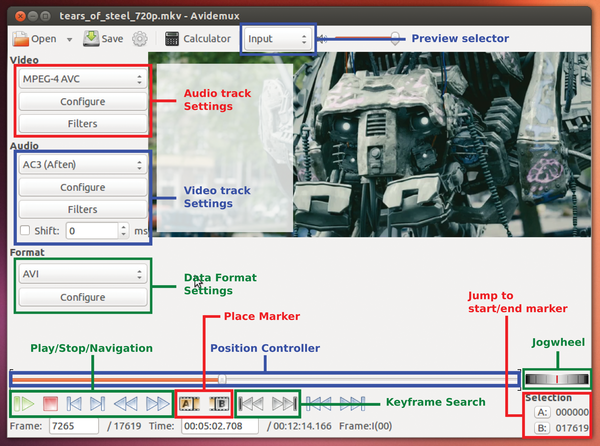 To navigate one frame at a time, you can click the left or right arrow, and to go one keyframe at a time, click the up or down arrow – provided the time slider has focus in the Avidemux window. Pressing the spacebar starts and stops playback. Under the time slider are some more buttons that search for the next dark frame, often found at the beginning and end of commercial breaks. Pos 1 and End jump to the beginning and end, respectively, of the loaded clip. Using the A and B buttons at the bottom right, you can set beginning and end markers for what should be a contiguous block. If a selection is active during a save, the software crops the video accordingly. You can cut out selected frames with Ctrl+X and add them to another location with Ctrl+V. However, because the editor doesn't provide an undo operation, it's recommended that you first export all the cut sections, made easy with the convenient fast-forward and rewind functions. In the second step, add the snippet to a clip by choosing File | Add or by pressing Ctrl+H. Note that Avidemux should not be your first choice for video editing – for one thing, it combines snippets only of the same resolution and frame rate. However, this limitation shouldn't be a problem if the data comes from the same source. Exporting cuts usually takes just seconds – and just minutes for longer clips, provided Copy mode is active for video and audio (on the left in Figure 1). In this case, the software copies the video and audio streams from the file instead of compressing them again, which spares some of the usual computation. If you want to compress the sections or add effects, compression, which occurs without user intervention, is the correct action to take. A job list (File | Add to Job List and File | View Job List ) even processes several projects all in one go.